You are here: Virgin Islands News Online » News » AG stands 100% by Wall report; Calls Walwyn dangerous! 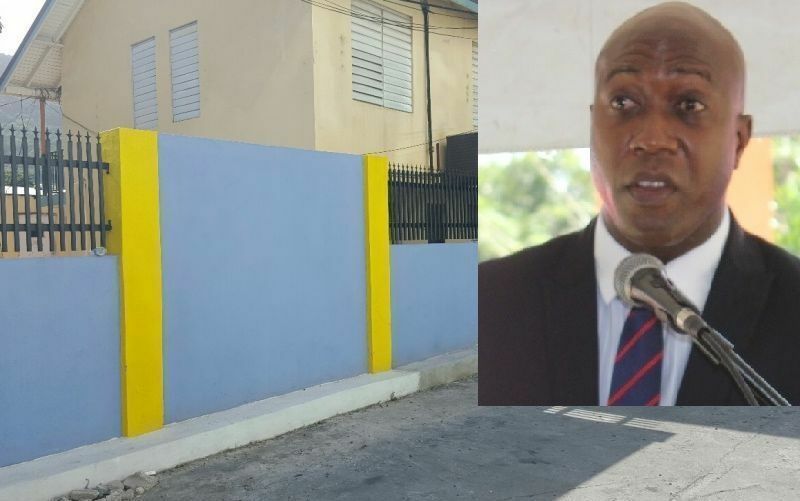 The wall, commissioned by Minister for Education and Culture, Hon Myron V. Walwyn (AL), was said to be overpriced and corrupt according to the report, costing taxpayers some $1.6M. Furthermore, on Friday, December 14, 2018, Governor of the Virgin Islands (VI), Augustus J. U. Jespert noted that the report on Hon Walwyn’s ESHS wall was sent to the Police for further action. 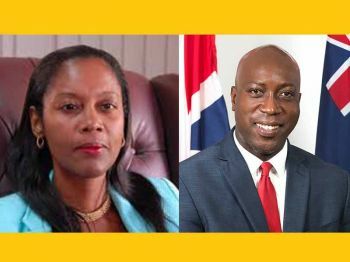 Following that announcement, Mr Walwyn immediately went on a rant, lambasting both the Governor and AG to dispute the report and even claiming that the Governor was interfering with the politics of the VI. 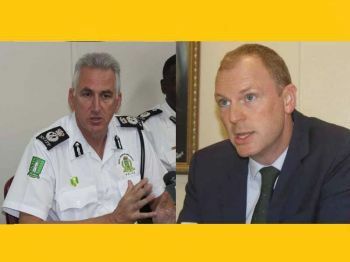 On Friday, following Governor Jespert’s announcement that the report was now with the Police, Mr Walwyn immediately criticized the Governor and AG over the findings, in a war of words. “When the institutions that support public transparency and good governance are attacked and undermined at will, and government regulations and parliamentary procedures are deliberately disregarded, we risk becoming a society where the rules that affect democracy and fairness are eroded,” she said. In essence, she was referring to the actions of Hon Walwyn as dangerous not only to democracy, but to the very foundation of good governance, accountability and public transparency. She stated, “Government officers and members of the general public must continue to ask for accountability in government and insist on better management of public funds, regardless of political affiliation." "To do otherwise is to consent to the wasting of limited public resources and the erosion of national integrity, both of which are essential for the development of the territory and prosperity of future generations,” Ms Webster noted. The AG warned that the statements made by Hon Myron V. Walwyn in interviews and elsewhere in the press are both “incorrect and misleading,” and that the contents of the report are clear. “As Auditor General I stand behind the contents of the Report and I fully support the members of my staff who work on the public’s behalf to promote improved public accountability and transparency,” she said. The Audit Report does not provide any valuation of the wall. It benchmarks the quantity surveying rates used by SA Architect for this project against PWD rates used on similar projects in 2015. This apparent incomplete computation includes only the works for “Block Wall Construction” (discussed on page 10 of the Report) but does not include the amount for “Rail installation and Painting” and for “Other Works”( such as Demolition works and the addition of a Bus Drop-off area). Those who were wondering why this matter in the police hands there you have it people. Falsely certified among other things. Prayers going up to get rid of these dam NDP conmen. Do you job fine lady. We now see what all his push-back was about. But then again he himself didn’t even know. What kind of advisor(s) does/do he really have who would advise him to publicly force the governor to reveal what exactly he is investigating? This minister is really dangerously, I fully agree. You sound silly! Anyone who wants to hide something would leak it to the press? It don't get any more transparent to me than giving the public the report. So the AG is saying that only now that the Gov laid the report the information good. Our elected officials were elected by the public snd they must report to the public! You must be the little fairy fast food worker from stt with the job in the Ministry? It’s called trying to control the narrative. Sleaze bag lawyers and politicians know this. The people or sodomites he put on that wall project were so intellectually challenged they couldn’t even produce false records to muddy the waters. Mrs Webster discovered the fraud in a deep sleep. That is how easy it was. This man don’t know who he playing with. Great Job. Hope she uses that same drive for the Pier Park and Airplane. I’m sure if what was found on the wall there is much more with the Pier Park and Airplane. FINALLY, this man has met his match. All those supporters who are there pumping you up to keep fighting- none- will be there for you if you end up in jail- here or overseas. Only your immediate family will be there for you. Enough already. Stop burning all these bridges; it will not end well. Been there done that. Since he is under investigation he should not be running in the coming election he called our dear former leader a MORON that was very shamed when he said that to a man like MR you know who I mean . Well he is a damn ///// from the /////////. And to add to that he talking in independent he should go live where he can get independent. The leader of this place should have get rid of this moron instead he is leaving him to destroy what we have let people open your eyes we have to get him out of our politics . He have no respect for our QUEEN representative and he over education what can he tell the students. Again I blame the sleeping leader. Look how walwy setting himself up to take the fall for all the others. So some of the bloggers were right all along, this dishonorable is a real narcissist for real. Poor fella the same man who say he was protecting institutions. Congratulations to the Auditor General on her response. It was a stupid looking wall from beginning. The design should have been in uniform with the other public schools' wall. Wall Win Camp super quiet boy!! ehh-lassss!!! Humble Him AG! Let's Go POPO we counting on you to pen the hog! We don't want to hear no more excuse, You Wall win hand picked the fake contractors! You Wall Win hand picked the man to sign off these fake certificates!! and You Wall Win continue to teach the youths how to steal, be bold and don't accept responsibility for their actions!!!!! Send the Minister and the man who signed off these fake contracts to ballo!!! and let the youths do community service and repay the debt owed to the country!!! and if Finance minister jump in there to try and cover things up send him up the camp to!!! his children need a good a$$ whooping!!! All of you who aided in this misconduct watch and see how your lives will be affected, because of one man greed and need for power!!!! Wake Up!!!! Shame on You Wall Win!!! Myrun. It was a campaign wall, and we all know it. Your own people now throwing you under the bus and more to come. Doc (well, maybe not doc, doc need help himself, but someone else in your camp) better advise you now because this is a train wreck in the making. is a total disgrace to democracy, and some Tarking independence. For who? Y’all still wan this man be Premier?? Remove him from public office immediately; he is a threat to our civil servants. How dear he threatenen the wheels of transparency and good governance. Sad outcome indeed for our little territory. Will we ever realize any change with his behavior. I am soo sore our children have to witness this from their moe. Why walwyn? Why you have to behave like this? Is power that so important to you? My family and I are soo disappointed in how you are handling this situation. How can we vote for you again this time around with how you are behaving? We know how BVI work with treasury; this is not a secret. Humble yourself and allow others to help you out now before you sink yourself in prison. We do not want to see this for you with all your potential. This sure don’t look good in the public square for the original NDP team and especially, for the new chairman. Ok Tall Boy, Your mouth is like a drill. The more you open it the deeper you dig. SHUT UP! Wakeky the writing on the wall; you going down for the rest of the team. tell funny man tek dat he think he could con the entire bvi with government funds.... lets see soon who hand to mouth. Him for blatant disregard for the same laws and protocol they agreed to. If we can’t hold our leaders accountable, release all our other prisoners, especially for the natural herb plant. Cocaine not included, fake commercial drug. Power, power, liars, liars, power, but not necessarily in any order. NDP a bunch of power hunger Leeeiars. Dissolve this government now- for the greater good. for walwyn, what a disappointment! Sad. Why he pick on her? Is it because she appears to be weak? Would he have pick on mark if he was in the same position? Obviously she don’t need the MOE to tell her about her department challenges. Very sure the last one that left as the head presented her challenges that she face; he couldn’t even last before the hurricane hit. If this department was fully equipped, most, if not all of you’ll would be calling another tune. People did worst than you but she never did a press release. Not the first her office critized and it won’t be the last. So why this report wasn’t sent to PAC for an inquiry. Greenhouse, pier park. Sea cows bay, Claude and Andrew after school programme, Peebles etc etc. millions of dollars spent. You gave the money to the small man in the community and the police got called? Wall Wind isn't a punk and he is not going to give up any names. Law enforcement better hit the streets to learn how to sting a tug in Tola. Really Minister. I expected better from you? Moreover, after studying all night and trying to relax, searching our news, this was not what I was expecting. All this needs to be shut-down soon. Depressing. How dear you betray your virtues to us in the education system; who can we trust? All i’m saying, I wish he had put all that money into our education system; there would be no need for a wall because our children would know better about themselves and their potentials and possibilities, and know how to chose between productive activity other than the spiral trend that we are witnessing from soo many. We are responsible for all our children, and we have to meet them at the circumstances they face at present. Not all are born with our VI silver spoons. Time to look out for all; meet them at the stage they are at and have the patience to pull them through. Never posted before, just sharing my experience and observations. Corruption cripples a nation and brings with it great poverty. Maybe this is the Ministry’s great master agenda. Why should the BVI strive when others have not? What makes the BVI so special? Why should this nation be so blessed? Why is the UK protecting this nation’s resources? They don’t respect me... I don’t respect them, their Governor, their laws or their money. I will do as I please and no one can stop me! Ms. Webster, Ole school who have experienced much more than what it takes to challenge this bunch. They have persons who would come across as friends just to get info to pass on. Be on your alert always; they run deep. The side of karma and justice always eventually prevails however, universal and natural order. Blessed. Again, Stay strong. Trefor and others would not be smiling right now with their blatant and disrespectful behavior of their “lord” anointed leader. Please set precedent gov; first politician to be jailed; we have suffered under the NDP like no other. These crooks not getting away this time. Thanks for the work your department is doing. We all know you need help with all this “alleged” curruption, we don’t need this one to tell us. Mr. Walwyn please allow due process. If I were you I would not even comment. It is in the police hands ...let it be. Let justice take its toll. If you are right it will be will known the end. If you are wrong...we will know that too. Don't try to show your hands or prove your point. just know the truth and watch justice prevail. It is amazing how these NDP members love to come up with “their own paid” evaluation. Hope this one was not paid with our tax money; Kong’s already took most of that budget for the pier park audit, should that be relied on.....in our environment.? COI Independent audit are the only reliable source at this stage. Why is this man still in an official capacity still acting the fool? Our country don’t need this right now, too much at stake for this guy destructive antics. Now this is a story with a twist. this is the kind of journalism we need in the BVI. ...FACT CHECKING... VINO...the CNN of the BVI. only time will tell if you are right or wrong. Myrun has now mash the tiger’s tale. My bet? He will lose in disgrace. Now! Until after the investigation if he so deserve. Had enough of this current government. They turned out to be a total disgrace, still can’t believed we voted for them. Heavy dark cloud will be looming over our BVI before this election move to its apex. Look for it on the arisen. Yeah!!! We just figuring out NDP party are “allegedly” engage in curruption. Wow!!! Who all new? Tell them Dominican girls work their obeah on this one. Time longer than twine. NDP1 is hemorrhage, another trump has been compromised. Help! The current Director don’t have a clue. He does as he’s told. There is something about manufacturing the truth and the MEC. Needs to be reeled in like slippery eel. Why didn't the audit report provide a valuation of the wall? How can you ascertain overspending if you haven't found out the true value of the wall? Is that another way of saying they made a guess of the cost and value of the wall. I am not an accountant but this can not be the way an audit is conducted when seeking an accurate account of how public monies were spent. I stand to be corrected if im wrong. How will she procure it when PWD said they won't help. PWD is her quantify surveyor. And the value of the wall is not the only thing in issue here. It is the procedures which have mostly if not altogether been breached. 80 contractors, all paid without work completed, no good standings etc. Come on!!... I too would like to know the true value of the wall as if a (block) wall can cost a million dollars to construct, then we are in more trouble than I thought. Please don't come on here with no nonsense!!! As I am starting to question, those of you who claim you went off to school & returned home with these fabulous degrees and we are in more of a rot than we have ever been before! Wall Wind is a LAWYER by profession!!!!! DON'T EVER 4Get THAT!!! He knew exactly what he was doing and he knew all the cronies who aided in stealing from tax-payers!!! This is another reason why he frequents these bars and solicit the young men who own equipments and fully well know they are not certified architects, contractors or engineers!!!! Gets them to do a $50,000 job, but sells it to them as a $15,000 contract! while the man who signs off on the fake certificates to state that the job was completed in order to have treasury pay out money!!!! $35,000 unknown to the lil man is shared between him and his corrupt colleagues!!! The Youths on the street talking as no one wants to go to jail!!! (To the Youths when it boils down to it, TELL THE TRUTH!!!! DON'T TAKE THE FALL!!! LET WALL WIN GO BALLO) out here selling fake dreams and giving false hopes to the youths, while yelling how much you care about them!!! NONSENSE!!!!!!! His brain was on all!!!! as he himself looked at the benchmarks himself, and marked up the project himself!!!! "As no consultation was done with PWD consultants, contractors or engineers" A BOLD FACE LIE!!!! and all of you, who continue to support and condone this behavior, we already know that you're a recipient of stolen tax payers money!!!! The writings are clear on the wall!!! We need to be rid of the NDP!!! If making up stories the only way to defeat Hon Walwyn at the polls its a sad day in BVI Politics. I wonder how much of the stolen tax payers money you have received???? or maybe your in bed with the Devil himself!!!! Thank you very much Mrs. Webster for standing strong and defending your staff and the report. As I always say, this minister always feels that when he comes with his innuendos, they we the people must just swallow it up and call it truth. He swiftly made his statement and as usual in his very disrespectful and arrogant manner bashed the Governor and yourself, let’s hear another statement from him defending this latest development. Hmmm; the BeeeWeeeeEyeee hot up. The fiasco behind this wall getting deeper by the second. At the end of it all; lets hope those in authority learn and do better. If any mis appropriation is found at the end of the investigation, the punishment measures the crime for all involved. All those NDP candidates who are sitting down watching this nightmare unfold for them thinking this is a Myron issue, can remain quiet like zebras in the wild. This will take all of you down if you are not careful. Somebody in that camp with common sense and logic, better advise MWM quickly. It seems like the leader is in trouble and his followers can help him so they will follow him in trouble. The Bar Association which is designed to regulate ethics in the legal profession is silent and mouth taped on this case. Lawyers in other jurisdiction were disbarred for less unethical behavior than is being displayed here in this case. This over cost expensive wall is unfinished still need about another hundred grand to finish .why is NDP 2 trying to run away from the mess they created .. Right there together as themselves now and their former selves. It's this mess Ronnie was trying to fix when they cheated the election and that's why he has separated himself. You cannot build a party with integrity if most of your players have none. This is all coming to the light of day. Good for you Ronnie to get out of that place once you saw that they would not accept change in any shape or form from a leader who could take the party to a better place. So based on the Report, what is the estimated cost of the wall?. Is it $372,000 for block wall construction + $412,256 for rails and $124,313 for other works, giving a total of $908,669. Can someone please help me out here. Nobody really knows. Based on the report something has gone wrong and instead of the Minister keep trying to poke holes in the auditor general's report, he should simply let us know what went wrong.